Motion Control Products range of high torque NEMA 23 Hybrid Stepping Motors are available with a holding torque up to 1.86Nm. A high torque stepping motor output more torque than standard hybrid stepping motors due to the use of powerful rare earth magnets instead of the traditional permanent magnets. 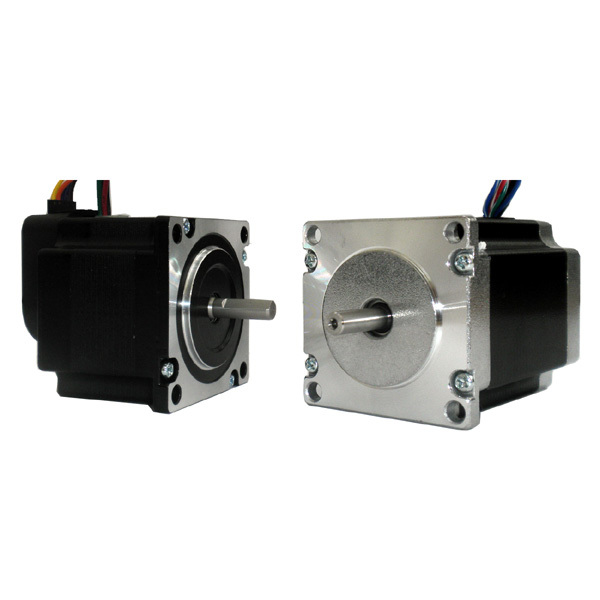 The motors are 1.8 degrees-per-step have single or double shaft and the option of optical encoder and planetary gearbox options available for most motors. We also supply NEMA 8 (20mm), NEMA 11 (28mm), Nema 16 (39mm), NEMA 17 (42mm) and NEMA 34 (86mm) versions. Typical applications for Nema 23 stepper motors include: Small to mid-sized CNC mills and milling machines , CNC lathes, Pick and place machines, Laser Engravers, Laser Cutters, Vinyl Sign Cutters, CNC Plasma Cutters and CNC Foam Cutters. Commonly referred to as the CNC Stepper Motor.